The flavour and fragrance of this shortbread is just so ‘Christmassy’ and I love to have tins of it in the pantry; some pieces beautifully packed for little home-made gifts and some for sharing with friends who pop in over the festive season. What’s more it is very easy to make. Place all the ingredients in a food processor and process until the ingredients are combined and just coming together. It is important to not over-process. If you don’t have a food processor, work the mixture lightly with your hands until combined. Press the mixture as evenly as possible into a 20cm round pie dish and smooth the top. Using a fork, prick the dough evenly all over. 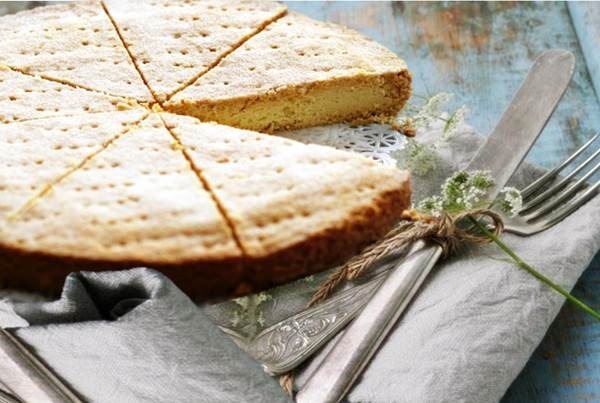 Place the shortbread in a preheated oven for about 35-40 minutes or until it turns a light golden brown. Remove from the oven and slice into serving portions then sprinkle with some caster sugar while still hot. Leave to cool before serving. It’s a nice quiet day and a perfect time to quickly put a batch of cookie dough together which I will keep in the freezer to ensure that fresh cookies are always available when friends pop in over the next few days. It’s a nice, simple recipe which can be embellished simply by adding nuts, currents, raisins, cocoa, bits of chocolate, essence, lemon rind and spices. And of course it stores well in the freezer. As it is the festive season it is also nice to wrap the biscuits in either cellophane paper tied with a pretty bow, or packed into a pretty box and hand them out as little Christmas gifts. Cut the butter into small pieces, place in a food processor together with all the other ingredients. Process until the dough comes together in a ball around the blade. Roll the dough into a long sausage shape, wrap in baking paper and refrigerate for 2 hours. Once the dough has chilled, cut the dough into thin slices. Place the cookies on a baking sheet lined with baking paper. Bake in a pre-heated oven at 200C for 6-8 minutes. 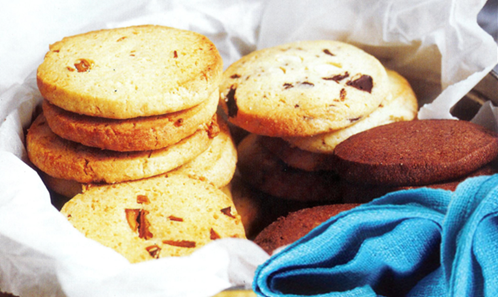 Remove biscuits from oven and cool on wire rack, then store in an airtight biscuit tin. Note: when adding essence, cocoa or spice, add together with all the ingredients prior to processing. To add nuts, chocolate, zest, raisins or currants; do this by gently kneading the ingredients into the dough prior to rolling into a sausage shape.